In life, we experience ups and downs. Not all moments are coated with sugar toppings but some are as bitter as gall. However, whenever life bites, one should always count their blessings, as not all of us are as lucky to have a roof above our heads and clothes to keep us warm. Not all of us are born with a silver spoon. This Thanksgiving, let’s not only give thanks but also think of the less fortunate. Offer a hand to those in need as you would never know how much it matters to them. A cup of hot chocolate on a cold winter’s day may warm the heart and make them feel loved. A little gesture goes a long way. 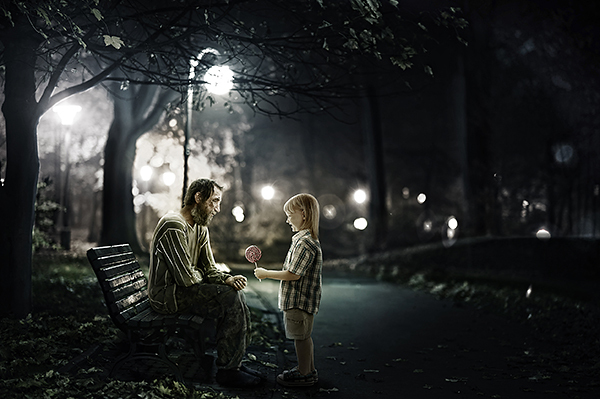 Check out this heartwarming photo montage of a child offering candy to a homeless man in this snippet. We hope this snippet will motivate you to offer a helping hand and to always appreciate the simple things in life. If this, or any other artistic snippets has inspired you to design your own photo montage, feel free to share it with us. You may send them to submission@123rf.com. Have fun!